Listed among supine backbends of yoga postures, the Fish Pose or Matsyasana has great benefits for the spinal column and subtle to chronic chest blockages. The posture has a high bar set for beginners, though can be made easier with props and slight modifications. For advanced practitioners, the matsyasana yoga pose comes handy for counteracting the effects of the Shoulder Stand pose on the neck, therefore must be kept as a restorative measure right after the Shoulder Stand in a wholesome yoga sequence. 1. Keeping your knees bent and the heels of your feet stretched flat on the floor, lie down. 2. Haul up your pelvis and fold your hands close beneath your buttocks. Remember your hands to keep palms down. Also, draw in your elbows and forearms toward your torso. 3. Inhale, and with that breath in fold both the elbows into your forearms. Now, lift your head and torso from the floor. Draw your spine in a natural curve as you are rising. Don’t force the stretch. 4. Firm up your shoulder blades and feel them crackle against your back. Simultaneously, lift your chest upwards, and your spine unwinding and elongating with this movement.5. Leave go of the crown of your head or the back, whichever part is deeply perceivable to you at this point of matsyasana steps. Feel the pull of gravity and delve into the feeling. Count your breaths to be mindful. Let your gaze be fixed outward at a point directly across from your raised chin. 6. Keep the knees still bent and remain at this point. Alternatively, you can stretch out your legs to the front of your mat and feel your leg muscles unwind and then engage. 7. A standard 5-10 breaths at this point is recommended for the fish pose. Feel every inch of your body fill up with oxygenation and then relax with each successive breath. Exit from the posture by exerting pressure into your arms rooted to the floor and by engaging your core, gently picking your head up and then away from the floor. A slight modification to ensure ease and support for the neck by bringing your palms close to the shoulders, this helps those suffering from neck pain. Create a soft cushioning in your supported fish pose for your head to nestle with a blanket underneath. The prop is effective for stretching out the lower back far gently and guarantees alleviation for a pained neck. This amendment to the standard pose, creating the Fish Pose with blocks is for taking the head back with perfect ease, yet enjoying the same sweet stretch to the neck and shoulders as it was in the standard posture. Keep the blocks/ bolsters under your lower shoulders and go from a simple Staff Pose to lying down flat on the blocks. The feet can fall open as to your comfort. Turn your arm around, making your palms face up and allow your shoulders to stay light on the block. Advantages of Matsyasana in this variation – Your neck will be prevented from overstretching and your face, throat, and jaw will feel decidedly more relaxed. Fold a blanket to half-length and make it thicker by rolling it over once or twice. Keep the folded, rolled blanket under your neck just as you had kept the block. Arrange your head on the unfolded part of the blanket and the folded part where your shoulders will touch the mat. Advantage- A gentle opener for chest and shoulder is on the cards, rather than the intense version of the standard Matsyasana yoga. Clears Constipation: The supported Fish Pose proves efficacy for boosting digestion through the massage of internals, increased blood flow to the pelvic gap, and getting things churning inside. Performing the posture twice a day at different hours generally does the trick for most people in relieving constipation. Stress Relief: The fish pose is a vital chest opening yoga exercise. A chest is where bottled up emotions tend to accumulate causing perceivable stress. Accompanied with deep, pranayama breathing, the Fish Pose can very effectively alleviate anxiety ridden bodies, especially operating at the chest. Fights Respiratory Disorders: Common breathing troubles related to asthma and spasms find a gradual but effective solution with an established Fish Pose performing habit. The lungs are more opened up, oxygenated blood rushes internally more and more, and all of this happens in a gentle, naturalized manner. Relieves Menstrual Cramps: For some women, cramps accompany menstruation periods almost mandatorily which makes them dependent upon the painkiller pills for that count of days. However, the same effect could be yielded without chemical drug dependence through the exercise of the Fish Pose. A mild stretch for the spinal cord, the lower back, and the hip flexors with this pose can go a long way during that excruciating time. Boosts Under-functioning Thyroid Gland to Cure Fatigue: Parathyroid and thyroid glands responsible for the secretion of the thyroid hormones can receive a real boost with the restorative Fish Pose. This hormone brings with its release into the bloodstream a rush of energy. If fatigue is your daily bane to fight, this pose should be indispensable. Bolsters Thinning Spinal Discs and Immunizes from Spondylosis: Poor posture from long deskbound days is not just makes you look bad, but also generates symptoms of osteoarthritis. You can do the Fish Pose to gently ease and stretch the cervix, the lumbar, and thoracic region to internally improve your posture, and the osteoarthritic-Spondylosis symptoms resulting from it. Avoid performing Fish Pose in case of cervical spondylosis, recent or chronic pain or injury in the arms, shoulders, back or neck. 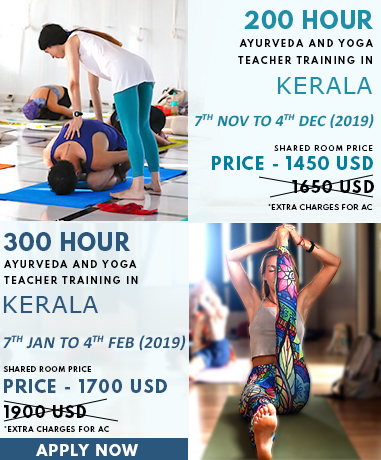 To Know more about Matsyasana, join yoga teacher training in India.